Gems and geodes make this white tiered cake pop with vibrant jewel tones. This single cake may be mini in size, but it sure is large in color, with wisps of teal and orchid and a splattering of metallic gold. Dripping in deep hues, this slender fall-inspired cake is wickedly good. A rich plum color, honeycomb top tier, and fondant floral adornments play up various textures. Thick marble-inspired swirls mimic the inside of a geode and create a sleek finish. A splash of gold adds a bit of a glam. Watercolor blots in primary hues give this wedding cake a fun and playful vibe. Clean and simple, this minimalistic cake revels in elegant beauty. Intentional gilded cracks show that imperfections can be beautiful, and fondant gem clusters create a bohemian chic vibe. Moody and dark, this single mini cake is modernly romantic with a black body and hand-painted roses. With a different personality in every layer, this three-tiered cake is a work of art. Crystals, quartz, and geodes combine with copper and marbled fondant for an edgy, yet feminine look. Industrial meets cozy in rugged strokes of chocolate brown and metallic gold. Scales in a mix of blue, green, and purple hues take inspiration from mermaids at sea. A thick layer of gold fondant beads and crystals graces the top tier for a vintage 1920s look in a modern style — a perfectly subtle juxtaposition. Ombre plum ruffle layers lend this cake a bit of whimsical charm, coupled with a wreath of greenery for an organic touch. Handmade sugar gems in vibrant hues, detailed motifs, and hand-painted shades of blue and gold evoke a rich, enchanting, and exotic feel. A pastel marble bottom tier, metallic gold paint splatters, and feather accents lend this cake an understated Bohemian flair. Watercolor drips in various shades of pink, red, and peach make this cylindrical cake hot, hot, hot, ideal for a bright summer wedding. A black canvas and jagged gold steaks make this sumptuous cake luxe and chic. From soft brick to red to neon orange, this ombré cake is a colorful delight. Solid gold stripes bring a preppy and timeless twist to a white wedding cake. A single bloom brings a touch of romance. Watercolor blue mimics the oceans waves, with heavy drips of metallic gold icing for a bit of edge. This may be a classic white cake, but a draping of olive garlands gives it a whole new look with a bit of Grecian inspiration. Thick, rough amethyst and gold watercolor swatches transform this cake into an oil painting. This agate cake in stunning teal and copper is nothing short of a masterpiece. Rustic meets modern in this two-tiered cake with a slightly naked top layer and marble bottom later. The result is romantically whimsy. This airbrushed cake imitates the husky tones of the beach’s sand and green sea, complemented by crystal toppings and encrusted salt around the edges. With a sleek black finish and gold metallic frosting, this three-tiered cake makes a dramatic statement. Coupled with a purple flower, the result is autumn romance. This non-traditional cake is all about the shapes. Round and hexagonal silhouettes contrast with one other while various geometric designs play together for an urban artsy vibe. Thick navy watercolor splotches grace only the bottom tier of this cake for a simple, yet stunning look. A hint of silver metallic frosting skirting the edges combines for a wintry feel. This dreamy one-tiered cake is drenched in glamorous romance, from cascading red blooms to a gilded body rife in texture. Why have traditional white when your cake can match the color of the sky? Warm florals juxtapose with a cool blue for some sunny elegance. Gunmetal black buttercream lend this cake a concrete resemblance while offset square tiers provide a bit of edge. Dripping edible gold paint, raw quartz, and tumbling amaranthus finish off the look. Rustic merges with glam in gilded pleats and a topper of summer botany. A bottom tier rich in ruffles pays homage to the frills of a wedding dress for a feminine look in a sultry, opulent blue. Each tier crafts its own persona, from a simple white to a copper foil appearance to hand-painted spring flowers. Topped with roses, the look is eclectic romance. Agate geodes influence the striking emerald design of the bottom tier, while a classy black and gold top tier serves as an elegant contrast to the jewel tone. This rainbow of a wedding cake takes inspiration from bold street art. Placed in the middle of an art gallery, it looks like a piece of art itself. Marble gray and delicate gold iced hibiscus combine for soft, modern romance. Blurred watercolor brushstrokes steal the show in this artistic cake, reminiscent of Impressionism. The couple’s monogram hand-painted in the middle adds a personal touch. Icy blue, whispers of metallic silver, and delicate lace captures the essence of a Parisian winter. A stunning plum and gold corner geode design and botanic accents lend this square tiered cake an earthy and organic charm. This white and gray-blue cake features loose-handed brushstrokes in different directions, taking a cue from the laidback vibes of the surrounding beach, with an adornment of hand-painted gold mussel shells for a full sea effect. A smattering of oversized palm leaves along the spine of this timeless marble cake creates a tropical flair. A light cobalt blue marble pattern, deep red flora, and flecks of gold make this cake a jewel-toned masterpiece. Unique patterns like musical notes are an ideal way to reflect the bride and groom’s personalities. In this cake, the look is beautifully whimsical. This wedding cake is a wine lover’s dream. A scattered gold medallion appearance provides texture underneath an adornment of wine grapes, figs, and blackberries, all for a Bordeaux inspired look. This magnificent cake truly is art. Square and rectangle accents in intricate watercolors offset four square tiers for an abstract look that perfectly mirrors the painting behind it. From a hexagonal shape to a marble pattern and copper foil icing triangles, this cake knows how to play up geometry. Lights and darks combine for a dramatic feel, accented with agate slices. Pastel and black have never looked so good. This dreamy cake painted in soft pastel watercolors calls to mind a magical seaside escape. Carefree wispy stripes of metallic gold add a bit of rustic glam to this garden inspired cake. Corner geodes in gold, silver, and violet blue are all this simple white cake needs for a breathtaking look. 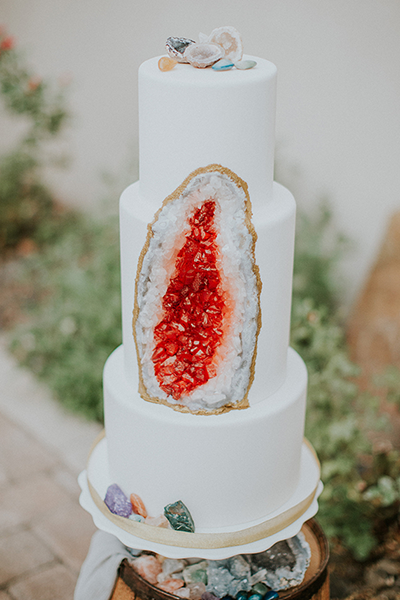 Paired with a matching agate topper, this cake is a real gem.